The KC Smartest Management C4 (SMC4) enables organizations to automatically manage their inbound and outbound social media, email, faxing and other digital messages. SMC4 enables companies to leverage the real time benefits of social media and emails. Pre-built dictionaries and content analytics ensure all outgoing messages meet regulatory, legal and corporate compliance before ever being made public. 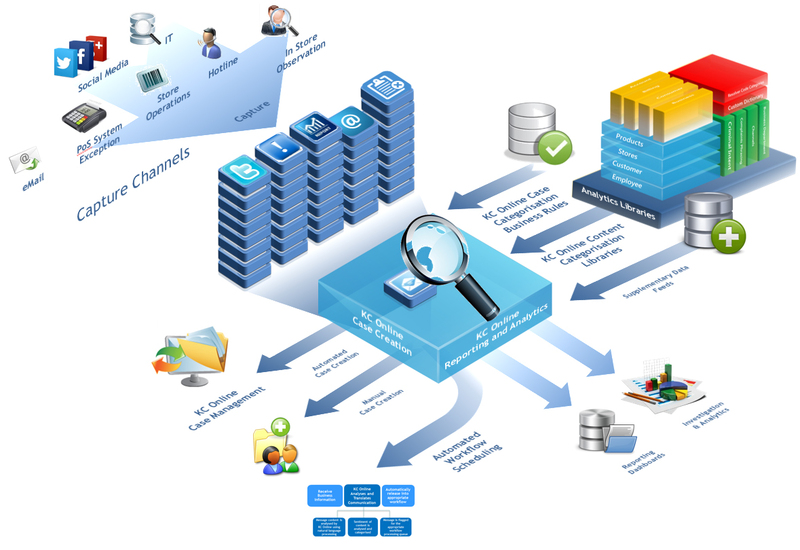 SMC4 is a compliant end to end digital media solution. 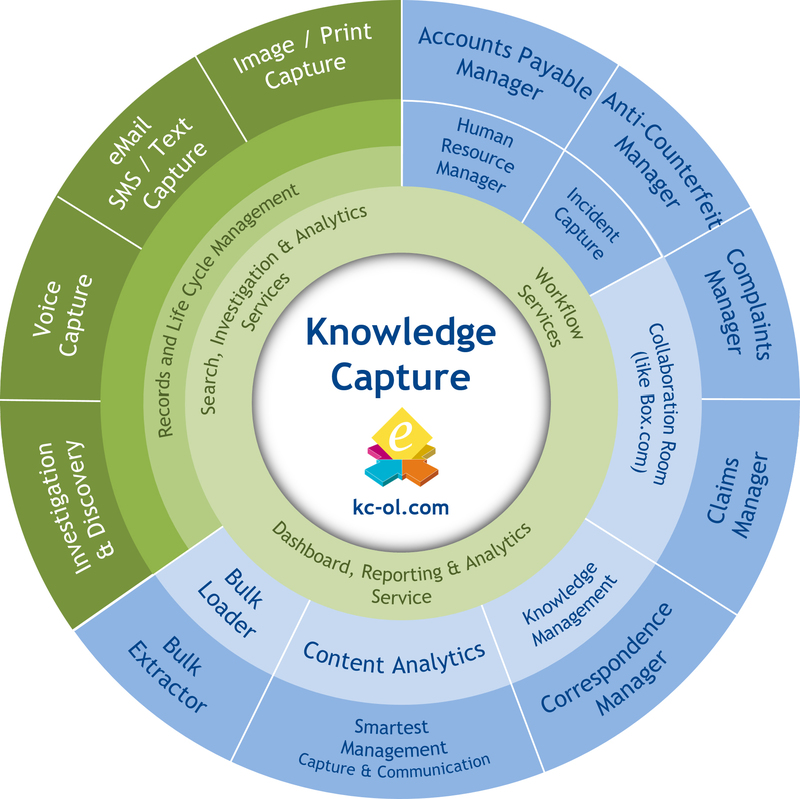 Knowledge Capture (KC) is a totally secure content management and workflow service, provided in the Cloud or OnPremise, with pre-built image, social media and content business workflow applications, enabling organisations to efficiently capture, control and automate paper, email and social media document related processes. 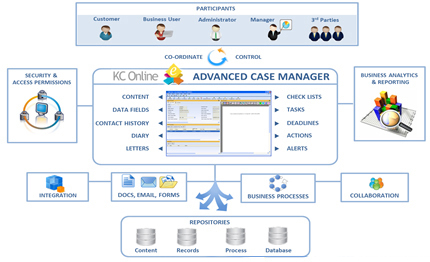 Utilising powerful read to use processes, KC business applications can be aligned to your specific business processes. By automating information capture and previously manual oriented tasks, the overall time taken to handle documents and information is reduced, streamlining your organization and increasing staff efficiency. The KC Accounts Payable Lite module enables organizations to bring control, efficiency and cost savings to the handling and processing of invoices, purchase orders and credit notes. Combining invoice scanning with fully automated invoice data extraction and an out of the box invoice approval workflow, KC Accounts Payable Lite ensures that financial documents are processed cost effectively, on time, every time. The KC Accounts Payable Active Pay is a comprehensive end to end Accounts Payable document handling and processing module which addresses the true needs of operationally dispersed but centrally managed businesses. KC Active Pay provides user-friendly applications that deliver powerful, configurable Accounts Payable functionality for improving critical accounting and financial processes, driving quantifiable ROI. The KC Human Resources module brings control, cost savings, compliance and efficiency to the HR department's paper, documents and processes. Incorporating the digital capture of all your company's Human Resources including document scanning and central storage of payslips, HR emails, PDF files, with secure electronic content management, the KC Human Resources enables HR departments to capture and store the mountain of HR paper based documents whilst seamlessly incorporating legal document life cycle control, destruction and defensibility through HR Records Management. The HR module includes a range of pre-built workflow applications including recruitment processes, new employee joiner processes, employee leaver processes and secure employee digital files. The KC Complaints Management module brings structured control, consistent levels of service and pre-approved issue resolution to the end to end complaint handling process. Seamlessly delivering the power to automatically capture and classify complaints, regardless of the means of the complaints communication, such as a customer complaint received by email, social media, fax, SMS etc. With the power of complaints checklist based workflows to ensure the total complaint process is followed. KC Complaints Management ensures that complaints are identified and efficiently owned and resolved first time, every time. The KC Insurance Claims Management module effectively brings together all aspects of company claims handling processes, from claim document capture and automatic data extraction through to strict Claim processing Checklist and Workflow based processes and approval escalation. 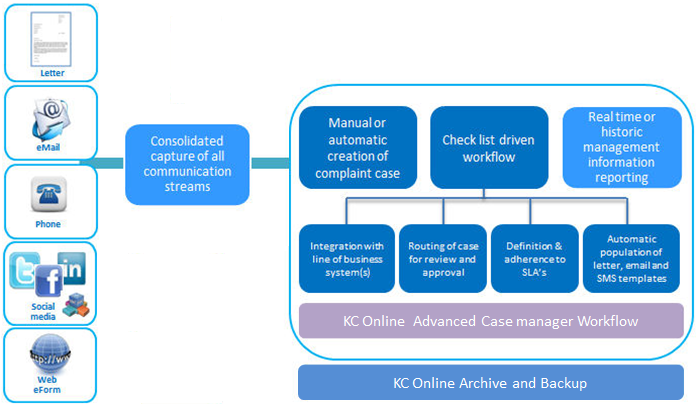 The KC Case Manager module is designed to enable the central capture, consolidation and mapping of your labour intensive document centric business processes, into highly compliant and efficient checklist driven workflows. 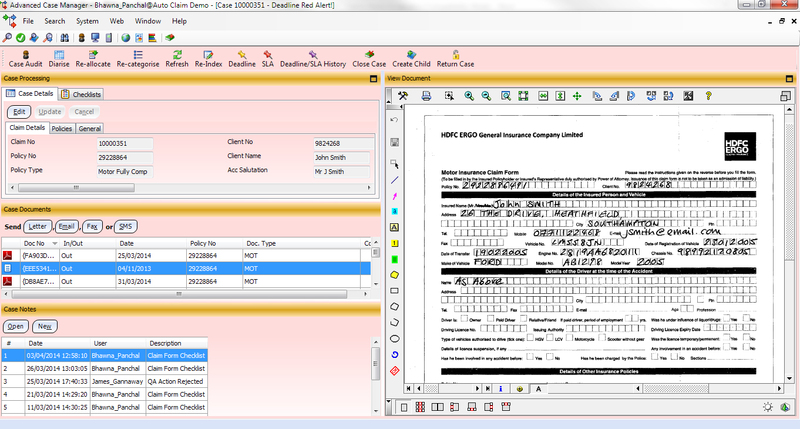 Enabling the consolidation of case related documents, such as consolidating all information relating to an insurance claim, a legal dispute or a counterfeit claim, rich multi-media content, client data and checklist workflow processes, KC Case Manager ensures your staff have the right information, at the right time to make informed process decisions, such as real time call centre access to a case file. The Knowledge Capture Bulk Extractor and Bulk Loader modules are highly flexible out of the box software applications, designed to enable organizations to quickly and easily extract documents and index records from other Enterprise Content Management (ECM) solutions, including IBM, SharePoint, OpenText, Hyland and other ECM solutions, and automatically load the documents and index records into our KC Cloud. 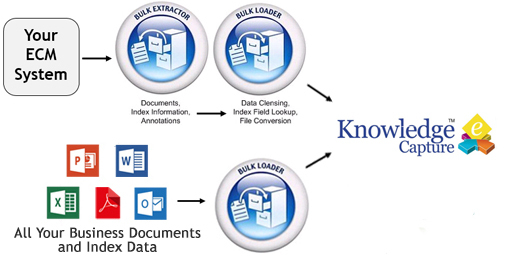 The Knowledge Capture Bulk Extractor module provides a cost effective migration of documents and index records between ECM technologies and our Bulk Loader module enables the bulk index verification, clean up and loading of documents and index records into KC . 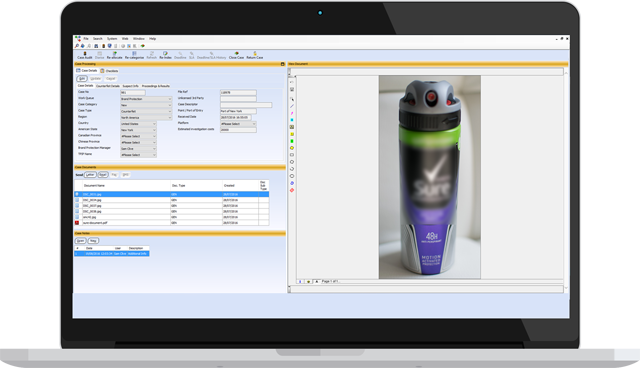 The Knowledge Capture (KC) Anti-Counterfeit platform enables organisations to manage end to end counterfeit processes, providing a single cloud solution to seamlessly capture and control counterfeit information from both the web and physical seizures. Knowledge Capture is an ecosystem of many software partners who have come together to combine the best of the leading anti-counterfeit tools to provide a single, focused KC service to address the needs of how to accurately identify counterfeited products and how to manage the take down process and wider counterfeit management processes. 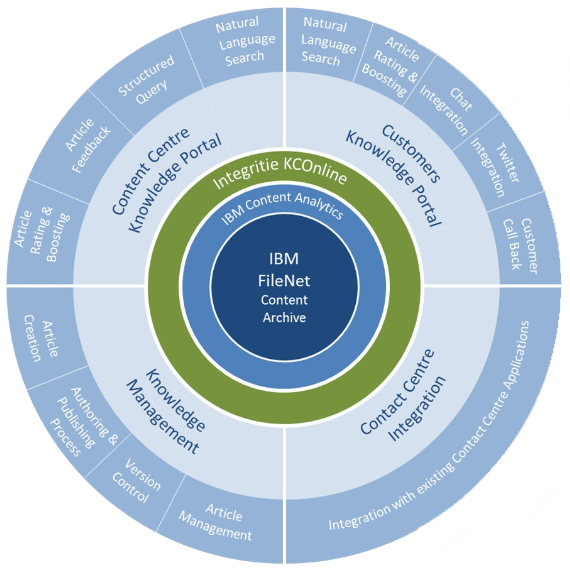 Knowledge Capture® (KC ) Knowledge Management Cloud application enables consumers to self serve their helpdesk queries, removing the need to phone or email a Call Centre for assistance. Using social media and email channels such as Facebook, Twitter and LinkedIn, consumer queries such as 'how do I fix error message x' are automatically reviewed against the Manufacturers technical manuals, Product Guides, User Guides, Product Management and Helpdesk Guides etc, and automatically reply to the Consumer with the solution answer. 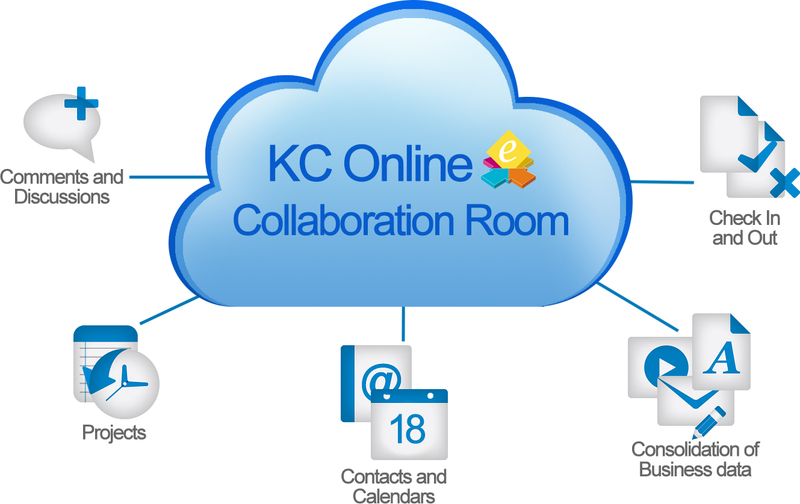 The KC Collaboration Room is 'like dropbox.com or box.com, a document sharing and collaboration module, enabling teams of people to work securely and efficiently together on a document or on project related documents. Using our Collaboration Room companies are able to capture social media, email, word, power point, and any other types of digital documents, enabling consolidated project activities such as legal files and contract negotiations. KC Collaboration Room provides documents checking in and checking out, version control and life cycle control.